More than 300,000 families in Louisiana can expect to receive their February food stamps this week - about ten days earlier than normal - as the partial federal government shutdown continues. Like every other state, Louisiana is following guidance from the U.S. Department of Agriculture, which runs the Supplemental Nutrition Assistance Program, or SNAP. The USDA is one of the nine federal agencies shuttered while budget negotiations remain stagnant on Capitol Hill. The only money available to fund February food stamp benefits, paid for in full by the federal government, has to be spent by January 20th. Sammy Guillory oversees the SNAP program in Louisiana for the Department of Children and Family Services. He’s warning recipients that they’ll need to stretch their money further than usual, because the next benefits won't come until March, at the earliest. “It would not be wise to just go and spend both January and February thinking you may get something else in February, because that will not happen,” he explains. Guillory says this change could also impact the more than 4,000 retailers in the state who accept SNAP. While the USDA was able to guarantee February benefits, funding for March remains unclear amid the shutdown. "We are in constant communication with our federal partner. They’ll advise us as soon as they know anything, but March is still up in the air. They feel confident that something will be done, even if the shutdown does not end. They are thinking maybe Congress will appropriate funding, but no one knows at this point," he says. In order for March benefits to be issued as usual, Guillory says an answer would need to come by mid-February. 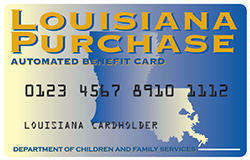 Almost 18% of Louisiana residents receive food stamps - about 385,000 families representing more than 830,000 people total. If lawmakers can’t reach a tax compromise by June 30, many state agencies would face steep budget cuts. Marketa Walters is the Secretary of the Department of Children and Family Services. In the event the Legislature fails to replace expiring revenue in a third special session, her department would be cut more than 20 percent.